All children need a healthy start in life. A child's health at birth can impact educational outcomes, and compromised health can have far-reaching effects into adulthood. 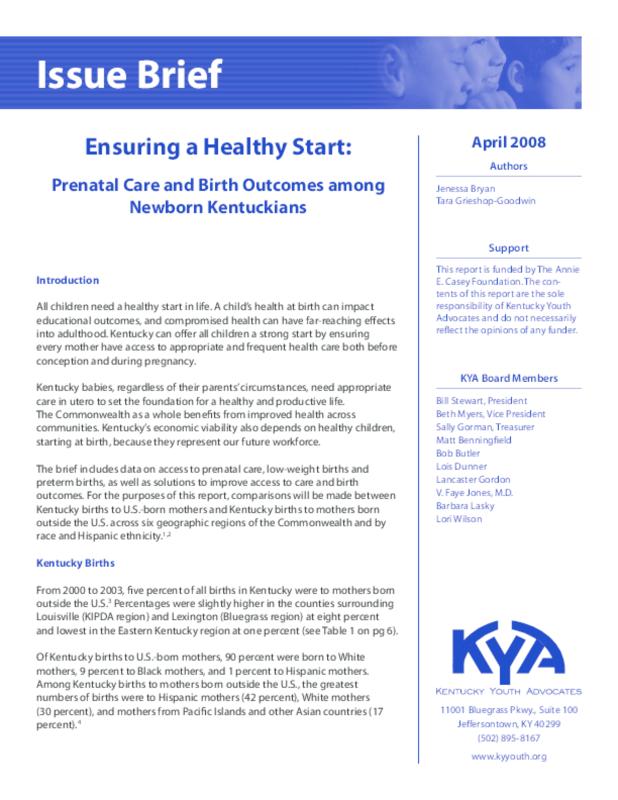 Kentucky can offer all children a strong start by ensuring every mother have access to appropriate and frequent health care both before conception and during pregnancy. Kentucky babies, regardless of their parents' circumstances, need appropriate care in utero to set the foundation for a healthy and productive life. The Commonwealth as a whole benefits from improved health across communities. Kentucky's economic viability also depends on healthy children, starting at birth, because they represent our future workforce. Copyright 2008 Kentucky Youth Advocates.